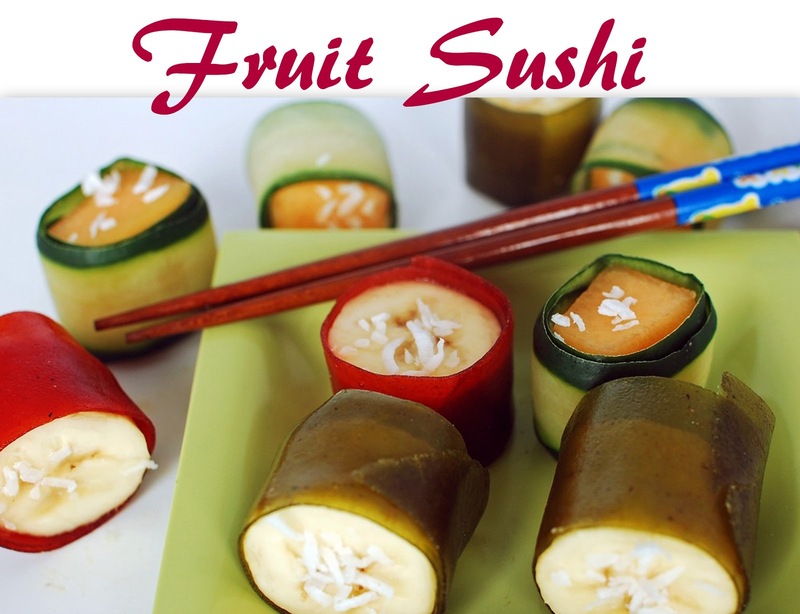 Have you ever hear of fruit sushi? My daughter spied it in a magazine quite a while ago and thought it looked yummy. Every few months she'd bring it up, "Mom remember that fruit sushi? We should make it sometime." The last time she mentioned it I committed myself that we would finally make it.
. . . But we just went to town with ours. They didn't look nearly as grand but we had a fun time. Last week I bought everything we needed to make our fruit sushi and then for lunch one day we made them up. We cut our fruit leather into strips and then wrapped them around our sliced up fruit. We then sprinkled on a little coconut and they made a fun and (mostly) healthy snack. My kids loved it. What healthy snacks are popular at your house? Thats such a cute idea! Ill have to give it a try with my kids! My son invented our favourite snack when he was about 18 months old. You need small apples and a thinnish carrot. Core the apple and then put the carrot in the hole and you have an "apple icecream". Oh my those look brilliant and soooo much fun to make. I love them. Such a fun idea! The fact that the kids get to make it, helps them to enjoy it that much more - love it!